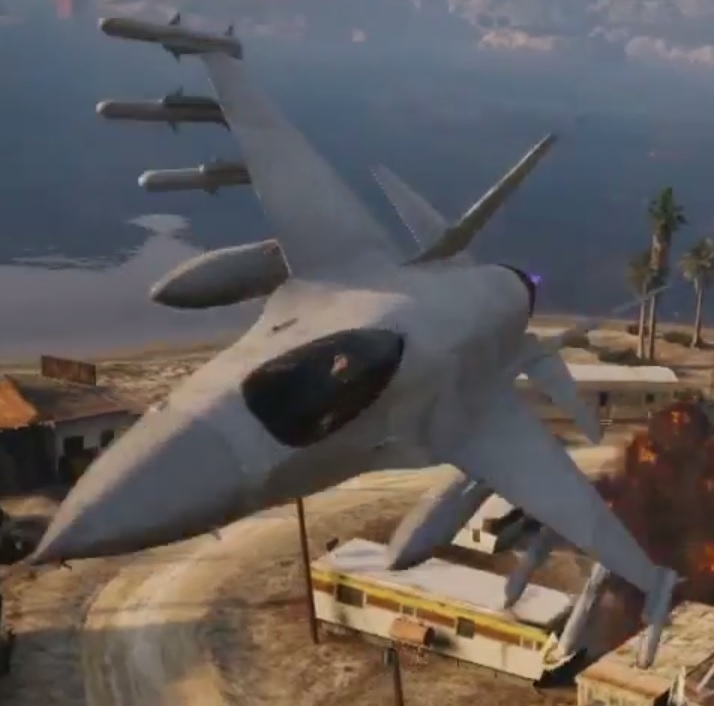 Fans of the nihilist hell of Grand Theft Auto 5 have the option of stealing a fighter aircraft. The aircraft is the ‘P-996 Lazer Fighter Jet’, clearly a derivative of the F-16. The most visible change to the F-16 is the replacement of the single vertical fin with twin canted-out tails. This is not an unheard of modification; Iran’s HESA Saeqeh is essentially an F-5 with twin canted tails. So what is the reason for the P-996’s F-35-style tails surfaces? Could it be for frontal radar cross section reduction, or improvements to the F-16’s already impressive High Alpha performance? 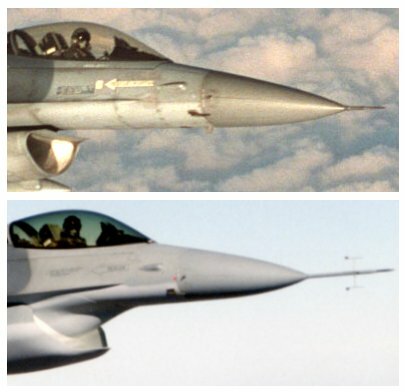 The theory that the twin tails are a RCS-reduction feature is questionable though, as the aircraft has no provisions for internal carriage of munitions and does not even carry CFTs, instead relying on external tanks in its portrayed configuration of six missiles (similar to the AIM-120) and two tanks. The fins also feature two pods in the front base (probably containing defensive electronics of some kind) which do not appear to be shaped for minimal radar return. Interestingly, in the real world Lockheed Martin has offered a twin-tailed, straight LERXed F-16 derivative to South Korea, which in many ways resembles the P-996. The new bifurcated intake is also a mystery; though some aircraft, like the Mirage F1, Hunter and F-20 do feed one engine from two intakes, a split dorsal intake is a unique feature, the purpose of which is unknown. It would seem that the obvious intake configuration to go for if RCS reduction was the key would be a divertless intake similar to that of the J-10B. In fact, a F-35 Diverterless Supersonic Inlet was tested on the F-16 in the 1990s and this would seem a good place to start in producing a new stealthier intake. Perhaps the bifurcation is used to mask the compressor face or facilitate faster top speeds? This second possibility is backed up by the new lower-drag canopy. The heavily riveted finish seems incompatible with stealth, maybe they it is made from a new lightweight steel alloy suitable for prolonged high-speed flight? Or could it be armour-plating? The designation is also puzzling, is this harking back to Northrop’s nomenclature which included the P.530 Cobra or a Hawker project from the 1950s? Was Northrop Grumman involved in the development of this aircraft? Is it an alternative to the F-35, or a lower cost supplement? Could the ‘P’ herald a return to the days of Pursuit fighters? The twin cannon armament is also unusual (I can’t think of a fighter since the abortive F-20 to feature this), and suggests it was developed with the Close Support role in mind, which would fit the theory that the highly riveted skin is heavily armoured. The ‘Lazer’ of the name appears to be a product name rather than being indicative of a laser weapon. The P-996 is a mysterious aircraft that begs many questions. The conventional take-off P-996 replaces a VTOL variant from the Beta version of the game which had a Harrier-like appearance. F-18 twin tail is intended to reduce transonic drag by forming “area rule” between main wing and horizontal stabilizer, also to produce much needed nose-lifting force for catapult launching by turning both rudders opposite way. P-996 may be supersonic, but I’m not sure if it is intended for aircraft carrier use. 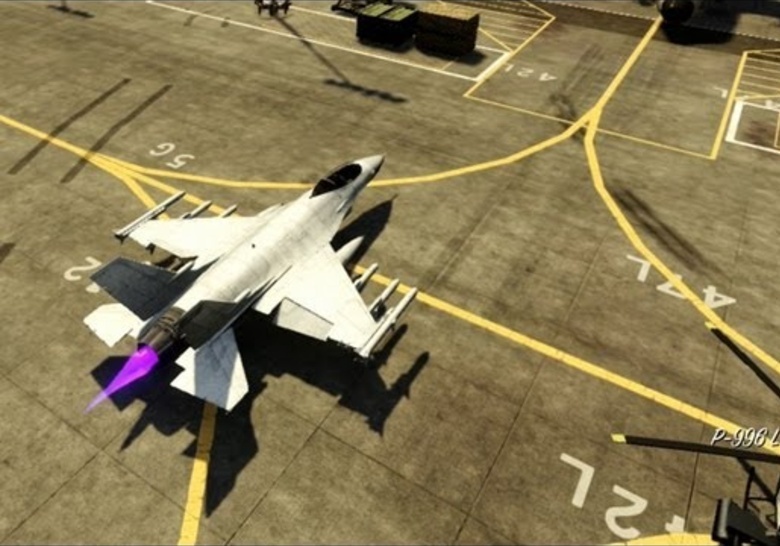 Going by Rockstar’s habit of mashing two vehicles together, I’d have to say, just by resemblance, that it feels like a mix of the F-16 and the F/A-18. The single thruster and overall body shape harken back to the original F-16, though the twin dorsals and handling resemble what you might find in the F/A-18. I’m not sure what the dual intake resembles, perhaps it’s just another way of R* avoiding copyright lawsuits, especially with huge companies like Lockheed Martin. They’ve showed this technique before in vehicles like the Elegy, it’s clearly a Nissan GTR/Skyline, but it seemingly has the rear end of some Toyota that I can’t remember the name of.